Garner, NC situated just a few miles south of downtown Raleigh is one of Wake County’s largest communities—both in terms of population and land mass. It’s location near the intersection of Interstate 40 and U.S. Highway 70 makes accessing the rest of the Research Triangle Region convenient for everyone. The population was 30,071 as of 2017 and has experienced a 69% growth since 2000. Due to major growth in the area, over 3,000 new residential units have been approved in the past two years. Garner is a popular choice for many who are looking to buy a home and raise their family in a safe, affordable and convenient location. When it comes to parking lots, we are ready to provide you with the best parking lot striping services around. 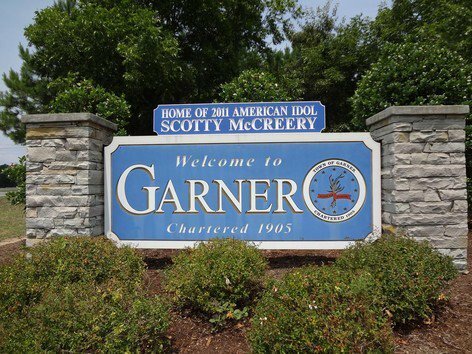 Located in Raleigh, we are proud to serve our neighbors of Garner too. As a business owner, you know that having your parking lot in tip top shape not only helps to keep Garner looking beautiful, but it also helps to keep your patrons safe. When cars know where to park, and how to flow through your parking lot everyone will stay safe. Our crews are ready to keep your parking lot in compliance with all of the different parking lot codes, so you do not have to worry about all of the different regulations. We are professionals and have you covered on all things related to your parking lot. Wake Forest, NC is a wonderful place to live, grow up, and call home. Located north of Raleigh, Wake Forest is a growing city located in both Franklin and Wake counties with currently over 40,000 residents. Wake Forest is a great place for businesses as well. Offering a business-friendly environment, it is easy to see why businesses here have been thriving for over a century and continue to grow each day. The climate, culture, and history of this quaint town have so much to offer everyone, and we are proud to be a part of the community. We love providing parking lot maintenance services to the businesses of Wake Forest, and we look forward to working with you soon. Whether it be a private property, a commercial property or an institutional property, every property owner needs to have wheel stops installed in their parking area. Wheel stops are vital to the safety of both pedestrian and car. We have all heard of cases where a motorist forgot to turn off a hand or floor break. Some of these cases have gone ahead to be costly and even tragic. Although many would argue that curbs can suffice to bar vehicle movements, this isn't the case. Wheel stops work more effectively to instantly stop any moving vehicle. They have been specifically designed to hinder wheel movement. That's why there are vital to the prevention of accidents resulting from accidentally moving vehicles. There are cases where motorists in a hurry to get out forget to turn off the breaks. There are also cases where car breaks turn out to be broken and faulty. All these can lead to the car taking off on its own once it has been parked. We all understand how disastrous the outcome of this can be, the car can ram into pedestrians and so on. This is why we need wheel stops to prevent such kind of eventualities. The wheel stop will instantaneously stop any moving vehicle. Still, in regards to pedestrian safety, wheel stops help prevent curb overhangs. The stops confine every car to its designated space thereby prevent overhangs. This being, pedestrians can safely walk on the passageway allocated to them. Though one would expect to have their car damaged on roads and highways, there have been numerous cases where cars have sustained damages on parking lots. There are many cases of cars banging into each other at parking bays. This can be avoided when wheel stops are properly installed in place. A wheel stop will prevent cars in opposite parking slots from encroaching into your space. This will prevent collisions and damages which can possibly result from that. Collisions can damage your bonnet, dent your car body, and shatter the rear glass among much more. All these will cost you in terms of repairs and replacement. Most importantly, however, we need not forget that a parking lot collision can also turn out fatal. This is especially if they happen with a lot of force. There are for example cases where drunk drivers ram into other cars while attempting to park. Wheel stops help prevent such accidents. In addition, they also safeguard against accidents from faulty breaks or ones left running. When your car rams into another car or injures a pedestrian at the parking lot, chances are high that you will have to sustain various costs. The aggrieved party can sue you for personal injury and property damage. Depending on the scale of injuries or damages, this can leave your bank account dented. It's always better therefore that parking bays have wheel stops to help prevent such occurrence. Most essentially, however, wheel stops should be installed for safety purposes. Morrisville, a suburb of Raleigh and located in Wake County. 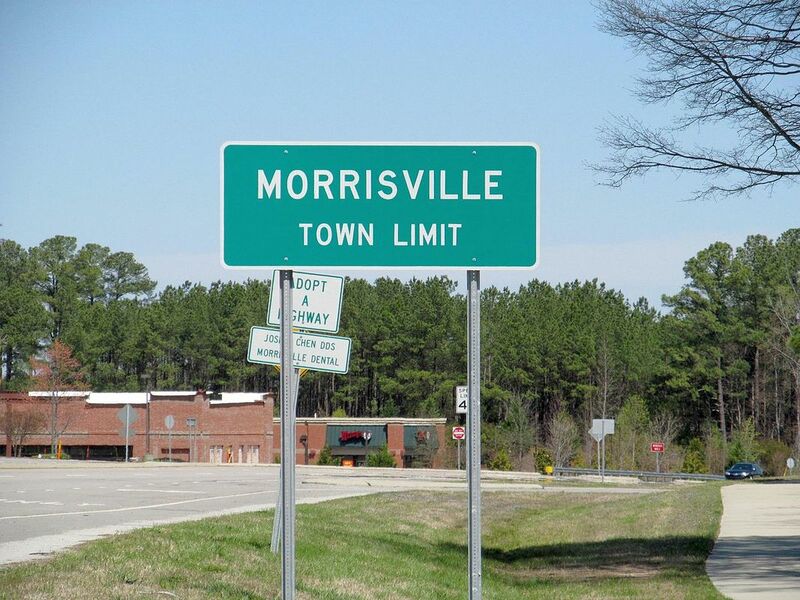 Morrisville is a small town but it is experiencing some nice growth. With great schools, restaurants, and shopping, Morrisville is a place that you would love to call home. Morrisville is home to one of the largest and tallest rock climbing gyms in the Southeast, Triangle Rock Club, which offers indoor climbing and bouldering. The massive facility has a 55-foot climb, a lead-climbing cave and more. We love all this town has to offer, and we love working with local businesses around the area. We are ready to provide you with a free quote for all your parking lot striping and maintenance needs. Call today. Sealcoating is a process of applying a top layer to protect your asphalt surface. It is done by the application of a coating on the surface which will help to protect your initial investment in your parking lot. There are two different kinds of sealcoating processes and here is a brief explanation of both so that you can make the best choice for your project. This method uses liquid asphalt which is mixed with loose rocks or chips forming a tough layer. Heat is used during the application and compression of the asphalt. The tough material and the emulsion which is very thick will add durability to the asphalt and can extend its life to four or five years. In this case, heat is not used to apply the coating. Most road works contractors use this method. The sealer and bidder CS-41 emulsion is applied by use of a spray process. The method will protect your surface from water, dirt, snow, sunlight and other elements penetration. The use of emulsion sealcoating is more affordable compared to hot oil or chip sealcoating but you have to be careful because if you choose to use this method, you cannot change your mind. The benefits of this method are the low cost but if there are repairs that your surface might need later, it can be a bit difficult to use another method. Although sealcoating extends the life of your driveway, it will eventually wear away. It is recommended to schedule another sealcoating every3 or 4 years. If you don’t do this, you might be faced with costly repairs or need to do a premature replacement. Proper care and maintenance of asphalts surfaces using sealcoating have been shown to extend the life of asphalt parking lots or driveways by more than 300%. 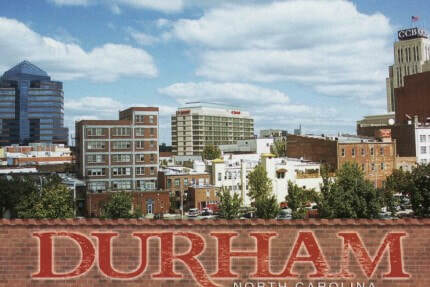 ​Durham, North Carolina, known as the “City of Medicine” or the “Bull City” is located halfway between the Smoky Mountains and the beaches of the Atlantic. Many people make this city their home which offers such amenities as art and science museums, Duke and North Carolina Central Universities, Durham Bulls Triple-A baseball, World-class medical facilities, numerous annual festivals, and countless popular restaurants. The Blackwell Tobacco Company is responsible for giving Durham its famous nickname of the “Bull City” in the late 1800s when they named their product “Bull” Durham Tobacco. By 1898, Bull Durham was the most famous trademark in the world! Today, upscale housing has been built in the same classic buildings where tobacco companies once made this city their home. Durham is also known as the “City of Medicine”, as more than 300 medical and health-related companies and medical practices make up its large healthcare industry. It is also a global center for information technology, biotechnology, and pharmaceuticals. This city is also home to Duke University, one of the most prestigious private universities in the world. Duke’s medical center ranks annually among the top in the nation and is the largest employer in Durham, providing more than 18,000 jobs. In addition to Duke, Durham is also home to North Carolina Central University, Durham Technical Community College, North Carolina School of Science and Math, Durham Public Schools, and many private schools. ​We are the premier parking lot striping contractor in the Durham, North Carolina area. Regardless of whether you have concrete or asphalt in the parking lot, we are the experts to call to service your business. When it comes to painting straight, high-quality lines, you need a company with knowledge, skill, and experience. We possess all of these qualities and have years of striping experience to guarantee your satisfaction. We know that you want professionals with the experience necessary to finish every task and we are here to help. We are well equipped to offer you an extensive list of parking lot services and will also work around your schedule so that we do not disrupt your normal business traffic. Safety is important to any business and sometimes it is important to install speed bumps to reduce the speed on your property. Regardless of whether you need new speed bumps installed or old speed bumps removed, we are the company to call for a quality job done well. We can breathe new life into old speed bumps that are in good condition with a fresh coat of paint to confirm that can be easily seen. Speed bumps that have good visibility are important for the safety of your pedestrians as well as the flow of traffic that moves through your parking lot. ​Our team of professionals can help you decide which materials best fit your parking lot and budget needs when you call for a free estimate. ​Wheel stops are another way to keep your parking lot looking its best. Parking lot stops are often used to let drivers know when to stop and keep their cars off of sidewalks and grass areas as well as prevent vehicles from causing damage to buildings and other vehicles. Although wheel stops are installed as a safety feature, they can also be dangerous as a tripping hazard for pedestrians. You will need to take measures to ensure the safety of the patrons in your parking area. Correctly painted and highly illuminated parking blocks will help ensure that your parking area is as safe as possible. We will make sure your wheel stops are installed properly and are easily visible to both pedestrians and vehicles. Wheel stops are available in many different types of materials. We can offer you concrete, rubber, and steel wheel stops. The least expensive option is concrete wheel stops, but the negative aspect of concrete is that they can break easily when mistreated by vehicles. Rubber is a more resilient material than concrete, but if you want parking blocks that are unbreakable, steel is the best option available. Your budget may dictate the type of wheel stops you ultimately choose, but no matter what you end up deciding we can install them for you. Our professional installers have experience installing all types of stops and look forward to assisting you in deciding what will work best for your parking area. Keeping your property well protected is important. Vehicles can often create accidental damage to building structures or can get too close to crosswalks, creating an unsafe environment for your patrons. Installing bollards near structures and crosswalks is a great way to protect these structures as well as provide safety for your clients. Most people don’t know what bollards are by name, but everyone has seen them and recognize them when they see them. Bollards are short posts that are installed to protect items and areas from vehicle intrusions. You can normally find bollards installed around utility structures, mechanical security gates, front entrances of buildings, and along the sides of crosswalks. Bollards are made from commercial grade steel and are reinforced with concrete in order to give added protection. Our experienced team can assess your property and give recommendations to areas where you could benefit from having bollards installed in order to add extra protection. Our expert installers are ready to assist in protecting your property by installing bollards where needed in and around your parking area. 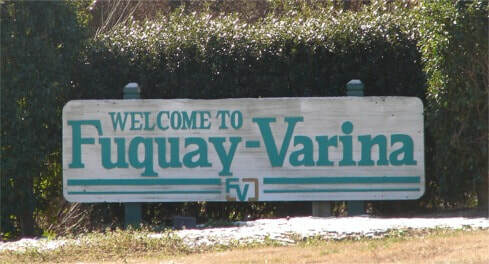 ​Apex is a town in Wake County and a suburb of Raleigh. The town of Apex was incorporated in 1873 and named for its location as the highest portion of the Chatham Railroad. Apex remained a slow-growing town until the 1990s when the Research Triangle Park began to attract high-tech firms to the area. Apex experienced extraordinary growth during this time as more technology companies moved to the area. Apex is served by the Wake County Public School System and several private and charter schools. Today, Apex has a charming downtown area that has been restored and is listed on the National Register of Historic Places as one of the best examples of an intact turn-of-the-century railroad town in North Carolina. This National Register Historic District has residential and commercial buildings that date back to the late 1800’s. Apex also offers a wealth of activities for all people. Not only is there a charming historic district to visit, but there are several major shopping centers only a short distance away. ​Parking lot striping is not something that most people think about, but as a business owner, you probably think about it more than the average person. Making a great first impression is very important for any business, and quite honestly the best place to make that first great impression is right in the parking lot. Keeping your parking area freshly striped is a great way to enhance the outward appearance and have your business stand out. Not only is a sharp looking parking lot appealing, it lets your visitors know you care about your business as well as their safety. Having properly marked parking spaces, fire lanes, handicap areas, loading zones, crosswalks, and speed bumps are all great ways to let your visitors know that you care about their well-being. That fresh coat of paint on the asphalt will look fantastic too. We have been servicing Apex and the entire Raleigh Metropolitan area for many years and it has become a passion of ours to help keep the city looking spectacular one parking lot at a time. We use the highest quality materials and the latest technologies to ensure the best coverage and the longest lasting paint job to protect your investment. 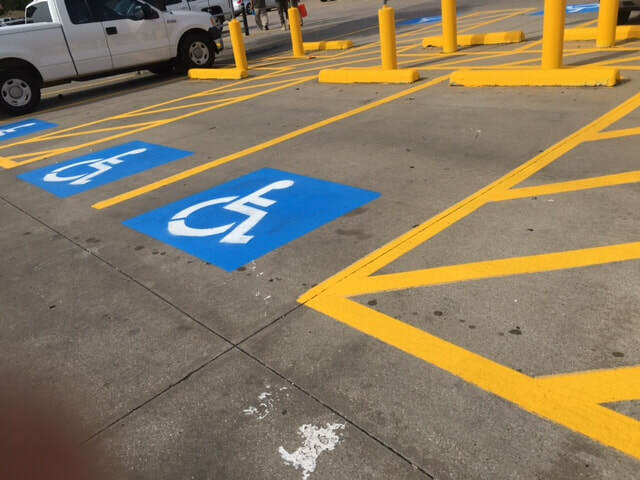 We understand that striping a parking lot is not the most desirable thing to spend your money on, however when it comes to compliance, safety for your customers, and an overall beautification of your property this becomes a huge responsibility for us. We look forward to taking the challenge and providing you with the best experience possible. ​Hiring experienced professionals is very important when it comes to servicing your parking lot. We understand that, and we want to be the professionals that you select to take care of the job. It does not matter if your parking lot is asphalt or concrete we will make sure the lines are accurately placed. The lines will not only be straight but will also be consistent in both color and width because we use the highest quality paint material and equipment. We take pride in painting the straightest lines in the entire Raleigh, NC area. For our team, there is no job too small or too large for our experienced crews to handle. As a business owner, it is your responsibility to make sure that the fire lanes in your parking lot are clearly marked and compliant with all city codes. We understand all of the codes required and will make sure that your parking area stays in compliance. When you call for service we will be ready to review your current situation and make you aware of all that you need to do so that you can avoid an unpleasant visit from the fire marshal. The ADA or The American Disabilities Act is a law that sets specific requirements for businesses to have a set number of handicap parking stalls available based on the current size of your parking lot. Just as with fire lane compliance, we understand these codes and will make sure your parking area is compliant. We also have all of the proper ADA approved stencils to appropriately stencil the handicap logos on all your stalls. The stalls will require crosshatching, wheel stops, and proper signage as well. We will discuss these requirements with you when providing you with a free quote. Cary, NC is a great place to live, work, and raise a family. Located in the Triangle area of North Carolina just between Raleigh and Research Triangle Park, the area is continually thriving and growing strong. Cary is located within 20 minutes of great universities Duke, the University of North Carolina, and North Carolina State, and has one of the highest median incomes in the state. The city of Cary is also nationally ranked among the top 20 safest large cities making it a great place for you, your family and your business. We love providing parking lot striping services to all businesses in and around Cary and we look forward to working with you soon. ​We provide striping services for both concrete and asphalt parking lots. We are ready to assist you with all of your striping, compliance, and maintenance needs in Cary, NC. Our crews are professional, prompt, and courteous and we treat your property as if it were our own. We are a full-service parking lot maintenance company. We provide free quotes for all jobs and look forward to providing you with excellent customer service, along with amazing parking lot striping. No matter if your parking lot needs full repairs, or you simply need a restripe, we can help. Our crews can handle all types of jobs both large and small. We strive to ensure that our work will not stop the normal flow of traffic to your business. We schedule a time with you or your project manager for us to do the striping job during hours that will fit best with your schedule. Although our high-quality paint dries quickly and allows for traffic to drive on it within 15 minutes after applying, we still need to make sure the lot is clear before we can start the striping process. If your lot is super busy we may need to schedule to come onsite after your normal business hours, or we may schedule multiple trips where we block off and stripe one-half of your lot, and the following day does the other side. Rest assured we will work with you to make sure we are striping without interfering with your business traffic. ​In 1990, we were introduced to The American Disabilities Act (ADA), and all businesses are required to be in compliance. The ADA has set specific requires for your parking lot to have handicap parking stalls available, and the number of spaces that should be available will be calculated based on the size of your parking lot. Do not worry, we are fully aware of all ADA compliance rules and we will make sure your property is compliant and will pass all ADA required inspections. We also have all of the proper ADA approved stencils to properly stencil the handicap logos in all your stalls. The stalls will require crosshatching, wheel stops, and proper signage as well. Have you received a visit from the local fire marshal lately? Providing proper access for Fire, Police, and Ambulance is a requirement and is important for everyone’s safety. Having properly striped fire lanes with the words, “NO PARKING FIRE LANE” stenciled across the entire length of the fire lane areas is a requirement. There are many different codes and compliance rules that must be followed when striping a fire lane area. We will ensure that your parking lot will meet all fire codes, and pass all inspections by the time we are complete with the job. By having properly striped fire lanes you not only stay in compliance but are assuring the safety of all the patrons that visit your business. Fire emergencies happen fast, and being ready for emergency vehicles in your parking lot is a great importance.